Top row (left to right): 1. Diane Schweiger, 2. Jeff Reedy, 3. Laura Cassell, 4. David Thomas, 5. Donna Friesen, 6. Donald Hole, 7. Elizabeth Meyers, 8. Dennis Gee, 9. Gena Broadman. Second row: 1. John King, 2. unidentified, 3. Mike Downey, 4. Karen Gardener, 5. Harold McCallister, 6. Kimberly Minor, 7. Carl Karfs, 8. Robbyn Cerruti, 9. Kenneth Peterson. Third row: 1. Mark Weingardner, 2. Suzanne Bohrer, 3. Larry Payne, 4. Sandra Leavitt, 5. no picture, 6. Thomas McClelland, 7. Sharon Smith, 8. Richard Ludwig, 9. Linda Elkin. Fourth row: 1. Mrs. Jorene R. Page, 2. Mrs. Ruzicka, 3. 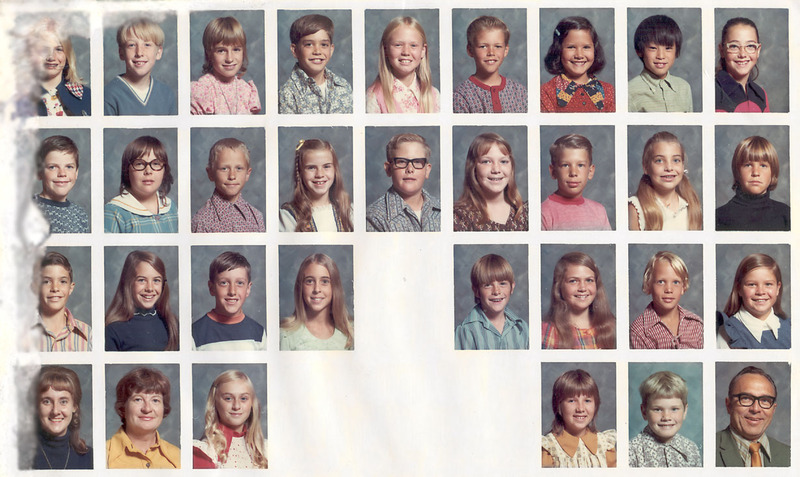 Sherry Cole, 4. no picture, 5. no picture, 6. no picture, 7. Annette Morris, 8. Steve Carlsberg, 9. Mr Donald Larsen. Credits: From the collection of Laura Cassell. Laura's picture has suffered some water damage on the left (which I have blurred to minimize the distraction). If you have a copy of this picture that is in better condition, please scan it for the archive. Thanks to Laura Cassell and Jeff Makaiwi for identifying the kids in the picture.